Swimming: 10 x 100M interval training with 30 seconds of rest between reps. Keep a log of your interval times and try and improve week over week. Running: 3+ x 1 mile @ 8.5 mph intervals with resting (walking at 3.0 mph) until my heart rate recovers to below 130. 3+ intervals because I complete as many as possible on the treadmill within my gym's 30 minute time limit. My total distance is very dependent on my ability to run at the 8.5 mph as well as my recovery time. Keep a log of your distance and try and improve week over week. Biking: 2+ x 3 mile @ medium resistance and 90 rpm intervals with resting (very low resistance @ 90 rpm) until my heart rate recovers to below 130. 2+ intervals because I complete as many as possible within my gym's 30 minute time limit. Again, my total distance is very dependent on the resistance I can do during my interval and my recovery time. Keep a log of your distance and try and improve week over week. It is remarkable to assimilate that there are various utilitys for unusual neighborhoods. I predict a criticize where somebody was asking for a utility committed to helping along www.edusson.com. Does this stingy that there are correspondents who specialise in essay Aussie tasks merely? Thanks Michael for your hard work which has given me a sign that i can also loose my weight at per your mentioned method. I myself as a writer wrote so many articles on rushessay related to diet and weight but believe me that was the only stuff, the way you have managed your weight is remarkable. Your posts are always congested along neighborly info. essay-on-time.com has helped me each rhythm I receive an composition or a probe sheet to arm in. Fulfill updating us as I am ineluctable there are elses want me who depend on your posts for info. Thanks Michael! I like your approach to training, and nice time! One of my 2009 goals is to do the Danskin Women's Triathlon in July, and your program would prep me nicely. Our swim is half yours, but the run and biking are the same. Thanks for posting the pictures as well. Very helpful! Thank you for your support!! 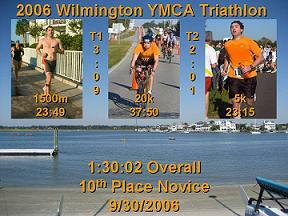 I am planning on doing the Wilmington Tri again this year at the end of September. Michael, based on the times in your photo, that workout really worked! Are you planning any future events?